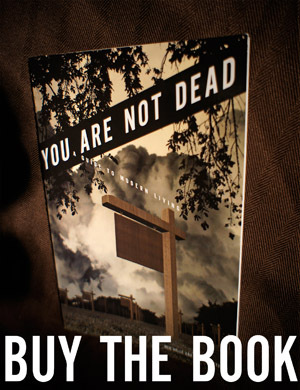 Prove to passersby you’re on the right track with a printed copy of You Are Not Dead: A Guide to Modern Living. This full-color, 64-page book is the delectable Canadian edition, maladjusted as appropriate from the US version on this site. Arrange magnetic quips and commands on your favorite metal surface: your refrigerator, a filing cabinet, a cold steel casket. The sky is the limit! The sky is not made of metal. Just like it suggests—get one copy of the guide and a set of magnets at a reduced price, with shipping free worldwide.